Adler Planetarium. Photo by Julia Bachrach, 2012. Many lovers of art and architecture, like me, have a special fascination with Art Deco. But there had long been a dearth of literature on the Art Deco style in Chicago. That all changed with the recent publication of Art Deco Chicago: Designing Modern America. Edited by esteemed architectural historian Robert Bruegmann, this gorgeous and informative book includes the contributions of over 40 authors. I was honored to be among them and to have written several “park related’ entries, including one on an all-time favorite building, the Adler Planetarium. Essays in the book are somewhat brief and the Adler Planetarium has a very compelling back story, so I’ve decided to provide an expanded version for this month’s blog posting. View of Bond Drive (now Solidarity Drive) looking east towards the Planetarium, 1967. Chicago Public Library Special Collections, Chicago Park District Archives, Photos. Max Adler (1866 – 1952) first offered to build a planetarium as a gift to Chicago ninety years ago, in the summer of 1928. The son of German Jewish immigrants, Adler was born and raised in Elgin, Illinois. In 1897, he married Sophie Rosenwald, sister of Sears, Roebuck & Company executive Julius Rosenwald (1862-1932). He soon gave up his career as a concert violinist to work for his brother-in-law. (Rosenwald would become President, and Adler Vice-President, of the nation’s leading mail-order business.) The Rosenwalds were an extremely philanthropic family. In addition to donating to Jewish charities and cultural institutions, Julius and Augusta Rosenwald gave tens of millions of dollars for schools, libraries, and YMCAs throughout the nation, often in impoverished African-American communities. View of the Fine Arts Palace in Jackson Park prior to its transformation into the Museum of Science and Industry, ca. 1925. Chicago Public Library Special Collections, Chicago Park District Archives, Photos: 00001_046_029_002. One of Julius Rosenwald’s most important gifts to Chicago is the Museum of Science and Industry. In 1911, during a family trip to Germany, the Rosenwalds had visited the Deutsches Museum in Munich. Enthralled by this science and technology museum that provided visitors with interactive experiences, Julius Rosenwald wanted Chicago to have a similar institution. He pledged $3 million in 1926, and would eventually donate another $4 million to transform the old Fine Arts Palace of the 1893 World’s Fair into the Museum of Science and Industry. Museum of Science and Industry, 2007. Photo by Julia Bachrach. Michigan Boulevard Garden Apartments, also known as Rosenwald Courts, was designed by Ernest A. Grunsfeld, Jr., at the same time as he was producing plans for the Adler Planetarium. Photo by Eric Allix Rogers. On June 7, 1928, the Chicago Tribune announced that the Adler Planetarium would be built on the lakefront and serve as the “center of activities for the 1933 world’s fair.” The article explained that Adler had not yet selected an architect, suggesting that the “domed building” would likely be designed to harmonize “in architectural treatment” with two nearby neoclassical museums, the Shedd Aquarium and Field Museum of Natural History. About a month and a half later, the Tribune reported that Adler had chosen Ernest A. Grunsfeld, Jr. (1897 – 1970) as architect for the project. Grunsfeld was related to Adler and Rosenwald. His mother, Tessie Grunsfeld, was Augusta Rosenwald’s sister. But in addition to having a close family connection, he was well-trained. Grunsfeld had a degree in architecture from MIT, and had also studied at the Ecolé des Beaux Arts in Paris and the American Academy in Rome. Despite his training at the famous French school that promoted Classicism, Grunsfeld had already begun producing buildings in Chicago that expressed a modernistic flair, such as the Michigan Boulevard Garden Apartments, an affordable housing project sponsored by Julius Rosenwald. Max Adler (center) and architect Ernest A. Grunsfeld, Jr. (right) visited the Deutsches Museum with its founder, Oskar von Miller, ca. 1928. Courtesy of Adler Planetarium. Adler Planetarium’s original Zeiss Company projection equipment. From Adler Planetarium and Astronomical Museum, An Account of the Optical Planetarium and A Brief Guide to the Museum, by Philip Fox, 1933. In late summer of 1928 Grunsfeld accompanied Max Adler on a trip to Germany to see the world’s first planetariums with modern optical projectors. Introduced by the Carl Zeiss Company of Jena, Germany, the equipment had been perfected only a few years earlier. Adler arranged to purchase a projector from Zeiss Works. (According to the agreement he made with Chicago’s South Park Commissioners, the projector would be the only imported item that would be included in the Adler Planetarium.) With this purchase, the Adler would become the first modern planetarium in America. In contrast to the Beaux Arts style museums nearby, Grunsfeld designed the planetarium as a sleek twelve-sided polygon (a shape known as a dodecagon) composed of rainbow granite, with a copper dome as its centerpiece. According to Philip Fox’s guidebook, a “hemispherical dome of 68 feet in diameter” and the 72-foot diameter of the central “circular planetarium chamber” were planned based on measurements provided by the Zeiss Company. Sited on a circular landform at the east end of Bond Drive (now Solidarity Drive,) the structure would become an iconic feature on a manmade stretch of lakefront parkland known as Northerly Island. Aerial view of Northerly Island and Burnham Park, August, 1931. Chicago Public Library Special Collections, Chicago Park District Archives, Photos. Alfonso Iannelli’s sculptural relief panel portraying Aries, 2008. Photo by Julia Bachrach. In 1929, Grunsfeld asked Chicago sculptor Alfonso Iannelli to create sculptural plaques to adorn the upper parts of the 12 corners of the building. Italian immigrant Alfonso Iannelli (1888- 1965) had studied first in Italy, then at the Newark Technical School and later at the Art Students’ League of New York under renowned sculptor Gutzon Borglum. In 1914, his first Chicago commission was for sculptures at Frank Lloyd Wright’s Midway Gardens. For the planetarium project Iannelli produced square-shaped panels to serve as the capitals topping the building’s streamlined fluted pilasters. Each is enlivened by a stylized depiction of one of the zodiac signs and titled in Deco style script. Beneath the block letters, each zodiac sign is also symbolized in traditional Greek iconography. These modernistic capitals were cast by Chicago’s American Bronze Company and surfaced in 22-karat gold. 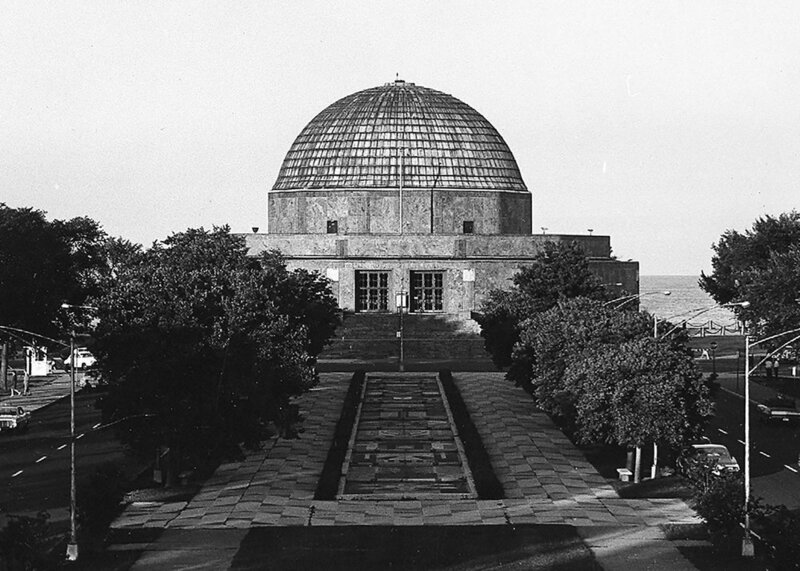 Chicagoans were enthralled when the Adler Planetarium opened to the public on May 12, 1930. More than 600,000 visitors attended the new astronomy museum within its first eight months of operation. The building itself also received glowing reviews. In 1931, the Chicago Chapter of the AIA presented Grunsfeld the Gold Medal—its highest honor—for his design of the Adler Planetarium. The Adler Planetarium was open to the public while construction was underway for the second World’s Fair, A Century of Progress, ca. 1932. Chicago Public Library Special Collections, Chicago Park District Archives, Photos. View of Terrazzo Esplanade and Adler Planetarium at Night, ca. 1935. Chicago Public Library Special Collections, Chicago Park District Archives, Photos. As preparations were underway for A Century of Progress, the National Terrazzo Association offered to sponsor the creation of a fountain near the Planetarium as its official exhibit. Lenox Lohr, director of the fair’s operations, described the 600-foot long reflecting pool as “a series of twelve graduated basins, the shallow water in each spilling over into the next one.” Grunsfeld designed this fountain and esplanade with acclaimed artists John Warner Norton (1867 – 1934) and Tom Lea (1907- 2001). Each basin of the vibrant and colorful fountain represented a month of the year. For instance, a large geometric snowflake symbolized January, while April’s basin featured large raindrops. The broad terrazzo plaza surrounding the pool was enlivened by geometric patterning. A continuous row of trimmed boxwood hedges bordered the fountain, reinforcing its straight lines. The outer edges of the plaza were enclosed by somewhat taller trimmed boxwood hedges. Adler Planetarium, Chicago. Photo courtesy of Wikicommons. Although the esplanade was meant to be permanent, it only remained intact for forty years. It was razed as part of the Adler Planetarium’s underground expansion of the early 1970s. A decade later, the planetarium underwent another major renovation with an above ground addition that wraps around the east side of the structure. While some may consider this a somewhat insensitive design, fortunately it was constructed in a manner that left Adler’s gift to Chicagoans intact.